For many, the assumption is that a meal from Chipotle is healthier than one you’d get at McDonald’s or any number of other fast food or fast casual chains. There’s an emphasis on freshness, and add-ons like beans, tomato salsa and lettuce would make diners think this is the option that will keep you on your New Year’s resolution path. So this latest New York Times story is surely bursting a lot of bubbles. According to their numbers, a Chipotle burrito or burrito bowl can have as many as 900 or 1,000 calories. This one meal can have nearly half of the maximum recommended 2,400 calories an adult consumes in a day. The biggest offenders are the meat burritos with all the fixins — cheese, sour cream and rice and beans included. And if that’s not enough (really, it should be) you can get a day’s worth of sodium in this one meal. 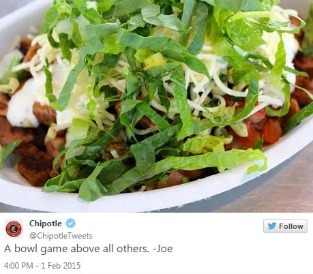 To their credit, Chris Arnold, Chipotle’s comms director, addressed the issue with the Times. (This really was the only course of action on this issue.) “We don’t manage our menu around individual nutrients,” he told the paper. But he does lay out an option that’s in the 625 calorie range: “a burrito bowl with white rice, black beans, chicken, fresh tomato salsa, sour cream and lettuce.” Note: no guac or cheese. It seems the meals with the highest calorie counts had these items, along with sour cream and chips. There are so many terms associated with food content these days: “natural,” “fresh,” “organic,” “cage-free,” “non-GMO.” The list continues. Many of the terms are generating all sorts of articles about how confusing food labeling and food marketing is. That said, when consumers think they’re making healthy decisions and find they are not, it’s frustrating. Shoppers will likely go another route if they find their food choices aren’t what they thought they were. It’s not necessarily that Chipotle wasn’t honest with diners. I can’t recall a time when the company ever came out and said, for instance, that if you eat their burritos, you’d be choosing the low-fat option. Fans just made the assumption because the idea of consuming “fresh” ingredients has healthy implications. This is the point where Chipotle can move forward with a campaign to educate diners about how to mix and match their meals to create the healthiest meals. The Times headline is definitely not a positive, but it can be an opportunity. Stepping up with a response that has greater detail to help people avoid eating a meal of 1,300 calories will keep them in line at lunch.